You spend a few days away from the office at an amazing retreat or conference. Your mind is exploding with possibilities. Your phone is full of new contacts. You can’t wait to put into practice all that you learned: amazing technology, best practices, thought leadership. You go home, head to the office on Monday and get caught up in a whirlwind of reality and negativity. Maybe it’s a flat tire or your boss greeting you with news that your top client is threatening to leave. The optimism and motivation you built at the conference is escaping with startling speed. What can you do? The secret to success is to create a sustainable model as a human being. Interact with people who will help you sustain your culture, attitude, performance, inspiration, behavior and discipline to achieve your goals. How do you take the conference on the road for the rest of the year? How do you package and protect what you learn and how you feel when faced with the noise of your regular life? I know how challenging it is to sustain what you learn and how you feel day in and day out. We’re all human. We have good days and bad days. So, you must surround yourself with advocates. Advocates are people who run around in this world and you’re just better for hanging out with them. They lift you up. They give the gift of time. They fight for you and show up! And they simply stand out. This is true in life just as it is in business. If you’re trying to start a fitness routine, research shows your results improve when you get yourself a partner. General Motors CEO Mary Barra credits a network of mentors for helping her make decisions at critical points in her career such as when she decided if she should take a human resources position at GM even though her background was in engineering. She solicited several opinions about this move from a network of people she respected. As an executive, I sustained my level of commitment by constantly meeting with really good people. I still surround myself with really smart people who encourage, motivate and inspire me. This is how we sustain our mindset. We lift each other up. We challenge each other. We brainstorm and collaborate. You become the people that you spend the most time with, so choose wisely. There’s a white noise that travels in this world. People move in similar patterns. To prove my pattern theory, next time you have a passenger in your car with you, try this. Wait a second or two longer than you normally would before you break for a stop light. What happens? Chances are your passenger is pressing their right foot firmly on the floor of your car, hoping that will cause you to do the same—and quickly. We’ve become conditioned to run in similar patterns. You must break out of those patterns (but always remember to brake at stop lights) to stand out and not just be another fish in the stream. Take a risk every day. Surround yourself with people who help you sustain yourself. Push yourself to be better. This is what gets you out of that white noise and gets you out of the pattern of complacency. 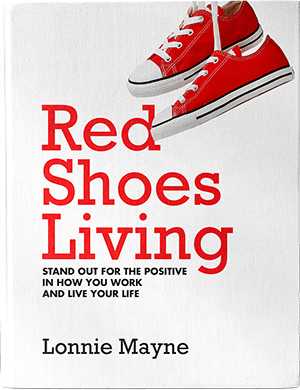 Red Shoes Living isn’t just about what happens within the work day. It’s incorporating the five pillars of Awareness, Gratitude, Everyone has a Story, Respect and Put Yourself Out There into every area of your life. 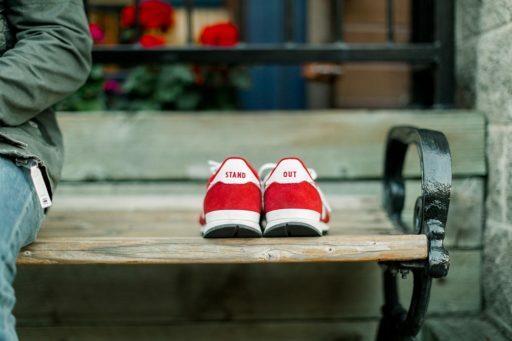 The best way you can be successful at doing so is to surround yourself with advocates who will help you sustain your Red Shoes Lifestyle even when the white noise and struggles of life threaten to take it away. If it’s time for you or your company to get on the path to Red Shoes Living, contact us online or call 801-783-7373.